Never be bored again with an adorable little arcade cabinet you can fit in your bag! 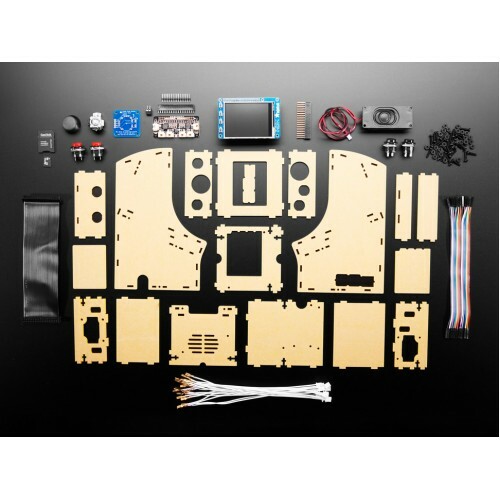 Comes as a big kit with lots of parts including all electronic components, the laser cut enclosure, and a blank SD card (you'll need to write the RetroPie image). 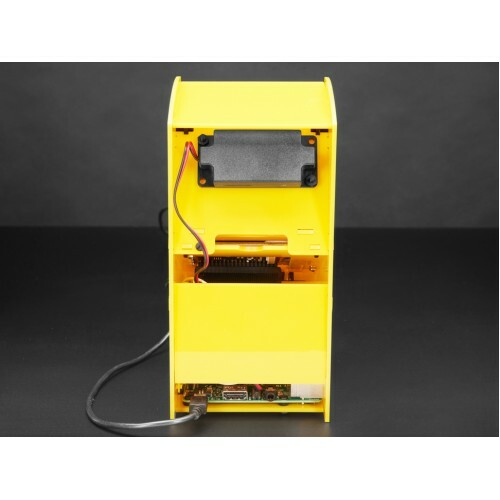 You provide a Raspberry Pi, soldering iron, solder wire, basic electronic hand tools, tape, etc. New! In December 2018 we're happy to annouce the newest-bestest cupcade ever. It's completely redesigned to be easier to use and faster to make. The kit now works with any modern Raspberry Pi (with 2x20 connector), including the Pi Zero and Pi 3. This kit has a lot of steps, so it's best for people who have soldered before and, even better, have a little Raspberry Pi/Linux use under their belt. Give yourself a nice long afternoon to put together (about 4-6 hours altogether). We played a bunch of memorable old arcade games, like Ms Pacman, Galaga, Donkey Kong, Arkanoid, DigDug, Gauntlet, etc with squee success on a Pi Zero. For more advanced games emulation like Super Nintendo, use a Pi 3. Note we don't have a ton of buttons, since the Cupcade is so cute and small. There are four buttons total, two next to the joystick for "fire" and "jump" and two in front for "coin" and "start". If you set up your Cupcade for 'horizontal' alignment, you can run 'TV' video games. If you set up for 'vertical' alignment, you can play classic MAME games that had vertical game grids. First: you can configure it for either vertical (Ms Pacman! Donkey Kong! Arkanoid!) or horizontal screen (Joust! Qix! Nintendo!). The controls can be set to either joystick-in-center or to the side. We provide for both configurations just pick which you want during construction. Fourth: To load new ROMs, simply plug in the SD card into any computer and drag the zipped up files into the directory. Or use WiFi to install over a shared folder. A Maker Faire exhibit of mine once incorporated a Pac-Man theme “for the old-timers.” It was a surprise then to see young kids all recognized the characters too. How? Smartphones! Thanks to emulation — running old code byte-for-byte on modern hardware — these classic games are still played and relevant a generation later. Much of the mystique of the originals lied in the cabinets and controls. Anyone can load a game on a smartphone or tablet…but the physicality of the arcade machine and its clicky buttons made them rare objects of desire back in the day. We wanted to capture a small taste of that, using the tiny Raspberry Pi computer. 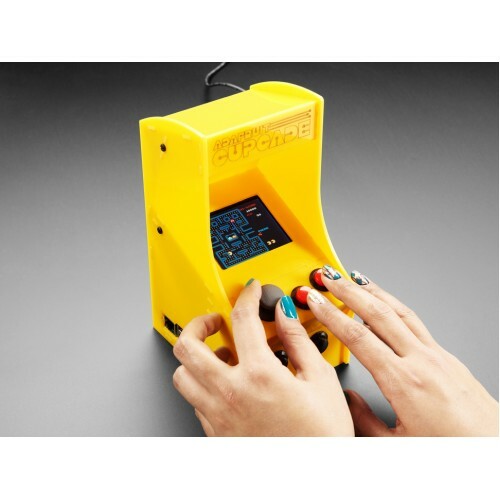 The result is a DIY kit we call Cupcade! 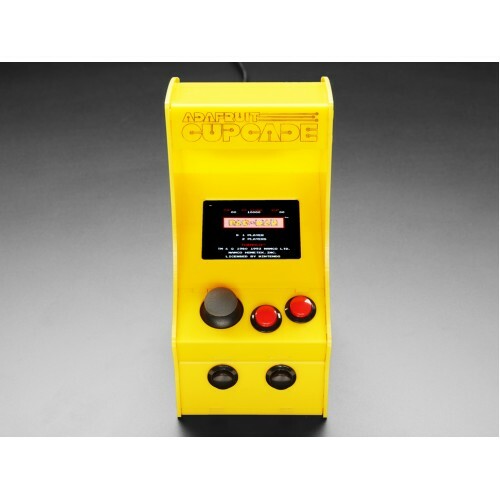 Cupcade isn’t the first, but it’s notable for using the Adafruit PiTFT display. The direct digital interface delivers a pixel-perfect rendition of classic games with none of the blurriness you’d get with a composite screen.